Literary evening dedicated to American experimental novelist William S. Burroughs, in observation of his centenary year. Featuring David Woodard, Burroughs' friend and collaborator, and Josef Rauvolf, noted translator of American Beat writers such as William Burroughs and Jack Kerouac into Czech. 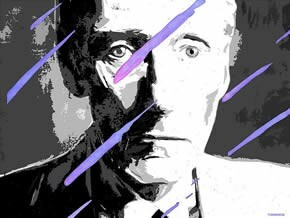 The program will offer an overview of Burroughs' work and life, including personal reminiscence of the presenters, and explore his legacy for the Czech literary scene. It will also focus on peculiar devices that appear in his novels. Film The Discipline of D.E. (1982, dir. Gus Van Sant, 9 min.) will be screened during the program. In English and Czech, with simultaneous interpretation available. The film will have Czech subtitles, courtesy of Vladimír Štepán. On Tuesday, Oct 7, you can watch NAKED LUNCH, a film by David Cronenberg based on William S. Burroughs' book. The film will be introduced by Josef Rauvolf, translator of Burroughs´ work.